Part 9 in a series of adventures seeking US coins in places where they are foreign. In the fall of 2005, while planning a trip to Stuttgart, Germany, I discovered that I could arrange a layover in London for about half a day en route. Being a true collector, I also collect “countries I’ve set foot in.” England would be my 17th. Since my arrival and departure would fall on a Sunday, I knew I wouldn’t find any coin shops. But perhaps I could still have a numismatic adventure of sorts – spending coins purchased from coin dealers (at a discount from face)! I visited Jack Lavis’s coin shop in Marysville, “Yesterday’s Treasures,” as well as “Abbott’s” in Birmingham. Between them and a handful of coins I’d found in foreign coin junk boxes over the years, I managed to accumulate around £100. Upon arrival in London, I began to spend my British money as best I could, for a trip on the Underground, lunch, a map, and so forth. I soon learned that the British mind-set is quite different to that of the Germans regarding their coins. Like the French, the British are prone to demonetization! This caught me off-guard. A few years before, I’d been stuck with a few 10 Francs coins that had been demonetized in favor of supposedly harder-to-counterfeit bi-metallics, but I’d only lost a few dollars on my acquisitions. Here on my trip to London, I did it again, but in a bigger way, bringing with me what I thought were current British coins: over a hundred large-size 50 pence coins minted until the mid-1990’s which cannot be spent any more. Theoretically, one could still turn them in at a bank – if it were open on a Sunday – but I found only one shop-keeper willing to accept one of the coins. So what to do with the other £50 worth? I encountered a jolly talkative fellow who was hawking tours of London on a double decker bus. To him I offered £20 of these coins in payment. He was quite wary. I told him that they were undoubtedly redeemable at a bank, but that I obviously couldn’t wait until Monday to do so; but perhaps he could do it? I almost had the bloke convinced, but he balked. As it was Sunday, after all, I made my way to the Third Church of Christ, Scientist, London and attended the services there. They were happy to take my coins during the collection. Afterward, I set off to purchase a map so I could find my way about London in a quick walking tour. I found a street vendor, selected a map, and proffered a stained old £1 coin as part of my payment. He began to test the coin – scraping it on the ground, dropping it, doing everything but biting it. It really was quite interesting to see the contrast with us Americans – I’ve never seen an American question the authenticity of a coin spent – unless they were looking out for Canadian coins. Of course, I took in what sights I could – Buckingham palace, the Thames, Parliament. Keeping an eye out for small round things is so automatic for me that I was drawn to this fascinating individual, covered with buttons from head to toe. I sure wished I knew what he was all about that day! Later I learned it was a reference to a famous set of bells with a 500+ year history, at a church called “Saint Mary le Bow” in a part of London called “Cheapside”. – but this article isn’t a travel log, after all, it’s a numismatic journal! On to Stuttgart. I am growing to love this wonderful town in the middle of the German state of Baden - Württemburg. It has a great shopping district, castles, a nice town square, several good coin shops that I visit every time I go, and of course, a branch of the Deutsche Bundesbank which still exchanges Deutsche Marks for Euros. As usual, I brought a bag of the old 5, 2, and 1 D-Mark coins, as well as some 50 pfennig pieces. All, including the silver pieces, were accepted without question. (However, I noted that they took pains to separate the silver 5 Mark coins from the non-silver – obviously they are recycling these coins for scrap metal). This is a wonderful thing about Germany, which distinguishes it from all of the other EU countries that use the Euro; all the others, as far as I know, have long since ceased to redeem their old coins. Obviously, Germans are proud of their Marks. They stand for the strongest national economy in Europe. In case you might be considering a trip to Germany, and might also wish to redeem Marks for Euros, www.bundesbank.de lists branches of the Stuttgart head office of Deutsche Bundesbank which will make this exchange. “Private customers can exchange D-mark notes and coins into euro in the branches of the German Federal Bank free of charge and for an unlimited period.” The offices are almost all open 8-13 (8am – 1pm), though some open 15 mins later or close 15 mins earlier. The branch in Stuttgart, at Theodor Heuss Str. 20, 70174 is open 8-13 for this purpose. Email is branch stuttgart@bundesbank.de. While walking about the town and seeking out coin shops, I encountered this interesting photograph in an art store window. They had no coins, so I had to move on. Dealers. I used Babelfish to get the website translated to English: http://babelfish.altavista.com, then entered the German website I mentioned above into their URL field. For Stuttgart, this yielded two of my favorite coin shops: Münzenetage Antike Numismatik (Coin Floor Numismatic Antiques), located at Marktplatz 14 and on the internet at www.muenzenetage.de, is my second-favorite shop. The coin floor is, as can be seen from the window banners, the third floor. The proprietors, Hartmut Shulz and Dr. Michael Brandt, are not as friendly as Stefan, but perhaps it is because they speak less English. I still like to buy coins in their shop, though. They have taught me that my rule – that it is always best to buy coins where they are foreign – needs to be modified a bit. This coin shop has helped me to finish my collection of German commemorative 5 Mark coins – except for the early, expensive ones – more cheaply than they can be obtained here in the US. Most of these coins are available for 30-60% of Krause there. Even the toughest one I was willing to pay for – the 1964-J – was (in the 2004 Krause catalog) a $200 coin in Uncirculated – but I obtained a prooflike BU specimen from Münzenetage for only $72. 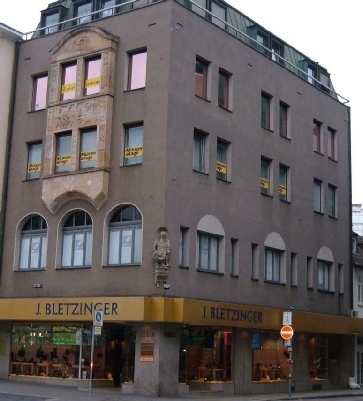 Münzen- und Medaillenhandlung Stuttgart (Stuttgart Coin and Medal Shop), located at Charlottenstraße 4, is also found on the internet at www.coinsmedals.de. The proprietor, Stefan Sonntag, is extremely patient and friendly, and speaks very good English. I usually look at all of the US coins he may have, but many of his better coins often are sold to a representative of one of the big US auction houses who frequents his store about once per month. This time, he had a nice AU 1888 Liberty Nickel for $48 (somewhat similar to the 1889 illustrated here), and a VF-EF 1905 Barber dime for $6. There was an 1870 Raised Rim Canadian 5 Cent silver piece in EF for $30. He also had a basket of well-worn silver coins in Good down to basal state from the 1700’s and 1800’s at only 4/Euro. These are great fun to look up, and to add to my German type collection. They included a Baden 6 Kreuzer of 1805 and a Hamburg Shilling of 1794. I also found a copper 2 Pfennig of Saxe-Coburg-Gotha from 1841. There were many others – and each took up to a half hour to find in the world coin catalog, there was so little design left. Not all the Stuttgart coin shops are found on the web. On a steep street going out of town, I found a little hole-in-the-wall coin / stamp / paper money / antique shop – the name of which, unfortu-nately, escapes me. The proprietor had an interesting array of paper money to sell. Though I casually collect Germany inflation notes of the 1920’s, I had never seen many of the notes he had. Part of the reason was that they were local issues from either the city of Stuttgart, or the state of Wurttemberg. I’ve completed the contract that led me to these travels in Germany, and I don’t know when I’ll be going there again. But it was a good ride. My several visits to these few cities have taught me to think of Europe as a familiar place, not foreign anymore.